This make is all about the fabric for me – it is a gorgeous soft viscose that I brought on sale at John Lewis a couple of years ago. Back then I didn’t yet appreciate the value of a good quality fabric and even at half price this was the most expensive fabric I’d brought at that time so I only purchased a metre. I dutifully prewashed it as soon as I got home, but then it was left sitting in my stash as I didn’t feel confident enough to do it justice. A few more successful makes under my belt and it was time for this to come out of the stash. Having only a metre meant I couldn’t use my go to top pattern the Sewaholic Belcarra (I need 1.25 metres for that) but thought it would be good to try something different anyway! Enter the Grainline Scout Tee. 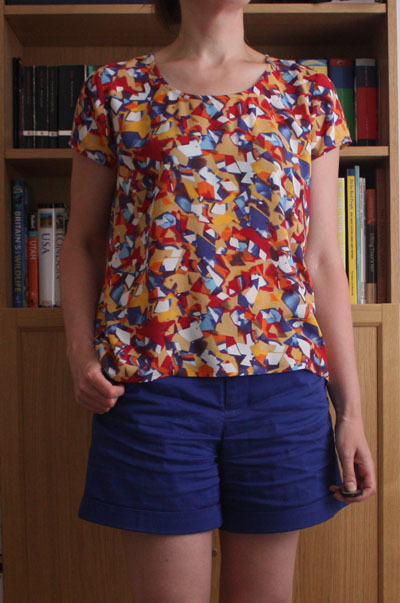 I’d only heard good things about this pattern from my friend Caroline – check out seven of her Scout Tees that she wore this year for one week one pattern here. Her day five Scout is actually the same fabric in a different colour way so I knew this pattern would be a good choice! 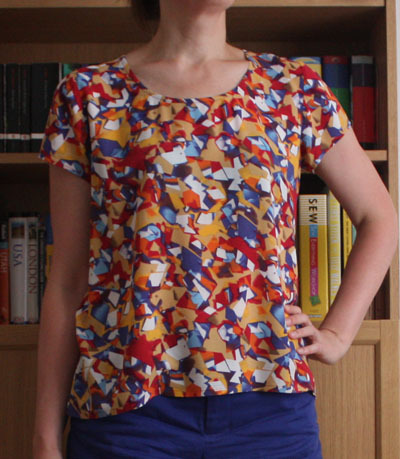 Also, I was keen to try another woven top without darts for a design that doesn’t break up the pattern of the fabric (not that it would matter much with this abstract print!) and it is one less thing to worry about when fitting the garment. My bust measurement would put me at a size 8 but I went for size 10 since I have broad shoulders and didn’t want to make a toile. I also lengthened the top a bit since I’m tall. I’m pretty happy with the fit of this in the soft flowing fabric, but think it would be too boxy for me in a stiffer fabric. It is my first Grainline pattern and got on fine with the instructions (although this is quite a simple make so not much of a test). One thing to take note of is that the seam allowance is half an inch rather than the usual 5/8. I wanted to use french seams and found the smaller seam allowance a bit tricky for this on the shoulder seams as I don’t have a quarter inch foot. So for the side seams I decided to make it a bit easier on myself and sewed a 5/8 seam allowance, given there was plenty of ease and I’d sized up this wasn’t a problem. With the flowing fabric and smaller seam/hem allowances I also found the neckline and sleeve hem a bit tricky to sew up neatly so next time I’ll probably use slightly wider allowances there to make it quicker to sew. Overall I’m very happy with this make and it has been worn quite a lot already! 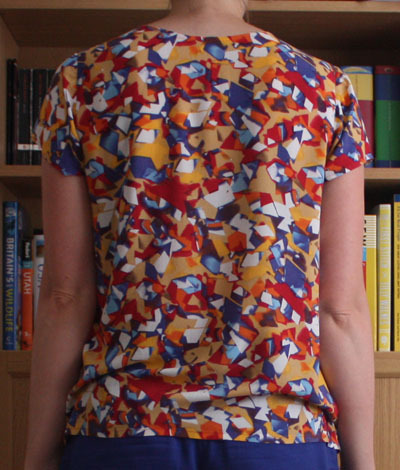 I love the print and the bright colours and even though it is a basic design think the quality of the fabric really steps it up so this top can be easily dressed up as well as down. Also I have been totally convinced that it is worth paying a bit more for good quality fabric as it makes this such a joy to wear! Yeah for the Scout Tee! I had the same problem with the seam allowance on the neckline on my first few – I ended up drafting a slightly wider neck bias strip to make it easier to sew. Your top looks lovely and I agree the quality of the fabric really makes a difference! That John Lewis sale was a good one. I’m glad to hear I’m not the only one who struggled with the neckline, will definitely cut a wider bias strip next time! I might try it out in a knit fabric since that worked well for you! 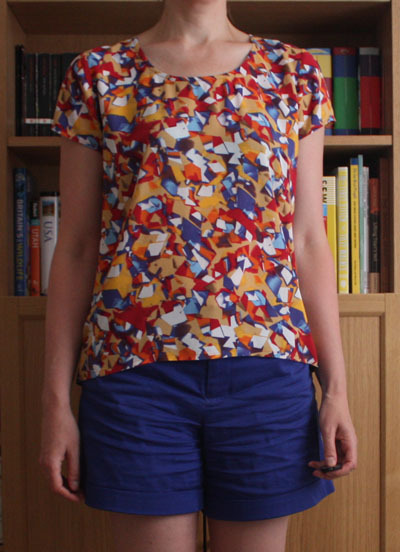 Yeah, although the shape is very much T-shirt I feel quite put together when I wear this! 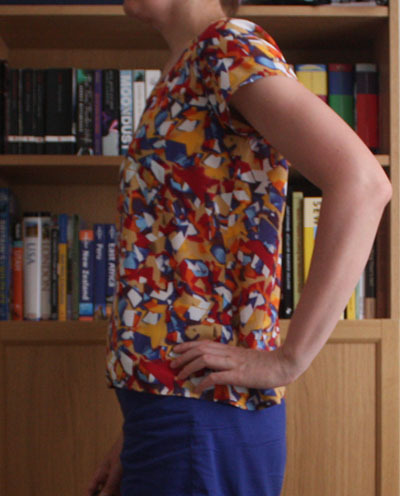 Given the lack of darts and minimal seams I think this top would be great if you have a (drapey!) fabric with a pattern that you want to show off as the design would not distract from the pattern. *Rummages through stash…* Nope. But I don’t need much persuasion to go fabric shopping – although it’ll have to wait until the New Year if I’m to complete my stash diet successfully! Good luck with the stash diet! I guess this is more of a warm weather top so no great rush now anyway! Super top, agree that decent fabric is worth the extra pennies, the drape makes this top so lovely, I made a muslin ages ago but in an old duvet cover in a muslin but hated it, maybe it’s because there was no drape, just an unflattering boxy sack, need to dig it back out! Yeah, I think the success of this top is very much down to the fabric and its drape. I’m actually quite glad I didn’t bother with a muslin for this one as it probably would have put me off too! Hope you have more success if you try a different fabric.